Letter identification and matching activities are often old stand-bys in preschool literacy. Spruce up an old strategy with this spring theme printable for preschoolers. It teaches letter identification and sounds! 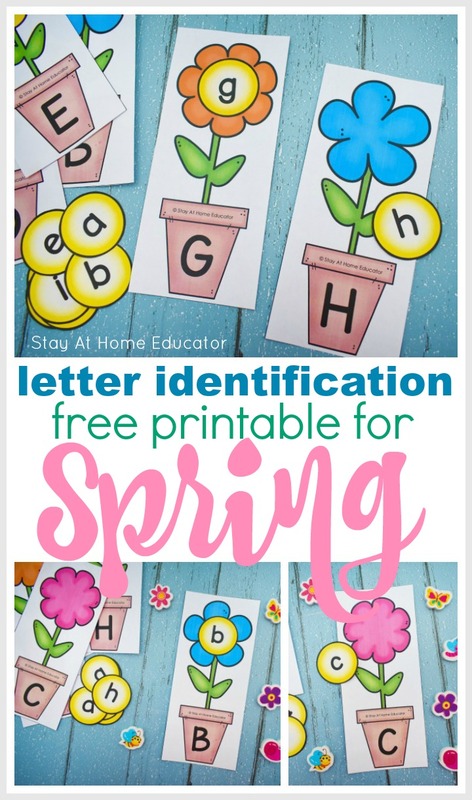 This post includes a free spring themed letter identification printable, so be sure to grab it at the end of the post! Preschoolers learn and apply early concepts of literacy in many of their everyday activities which is why as preschool teachers and parents it’s so important for us to provide multiple ways for preschoolers to enjoy those concepts. 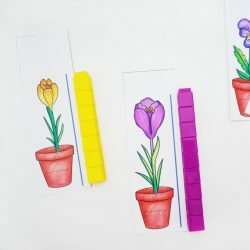 These flower alphabet matching cards are just one more way to help reinforce letter recognition and sounds skills with your learning preschoolers. You see, preschoolers naturally compare letters of the alphabet. They notice if the lines of the letter are straight or curved, if one is small or big, if one in in their name or not. These are all methods of comparing and important steps in literacy development. There are many different approaches to introducing preschoolers to letters and names, and every one of those approaches have some merit. You can use this free spring printable with any approach. These cute flower matching cards can be added to your spring theme, gardening theme, or even make a fun game for Mother’s Day. (Do you do a Mother’s Day tea at your preschool? Add this flower activity to the agenda). Even my little boys enjoyed these flowers. 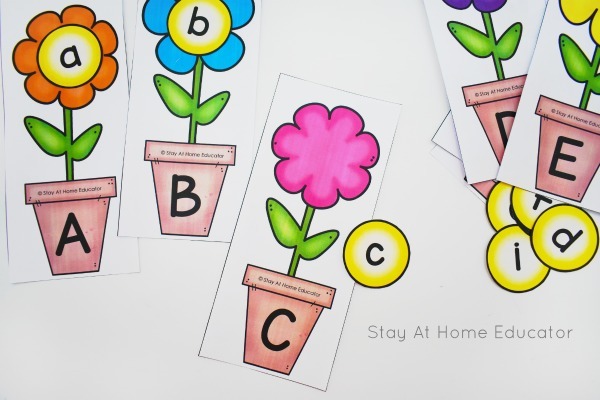 While maybe they are not naturally drawn to flowers, although one of my little boys adores the flowers in our yard, they have a lot of fun with these alphabet matching cards because they are drawn to the alphabet! And with the bright colors of these flowers, they are so inviting, too! As always, I’ll be offering multiple ways to use this printable in your preschool classroom. 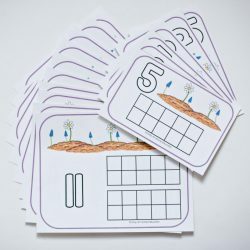 Be sure to read to the end of the post for all those ideas, and then grab your free printable measurement cards, too! Print the flower cards in heavy card stock, laminate, and cut out. You’ll want to cut out the circles for the center of the flowers, as opposed to leaving them in their little boxes. The letter mats can be placed in a dry erase pocket if you would prefer to save on lamination. Place the flowers in a pile and the flower centers in a second pile and put them all on a tray. I like to use the wooden trays from Melissa & Doug toys like these, these, and these. 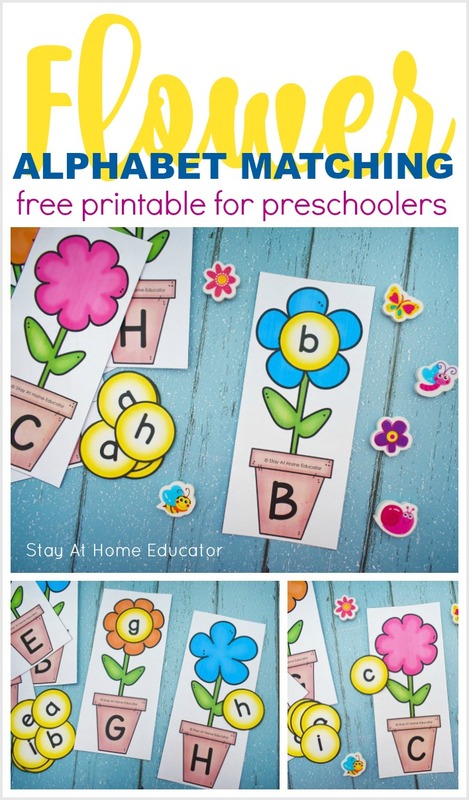 Now invite your preschooler to join you for some spring theme letter matching! These flowers are so bright and inviting! They are perfect for a spring theme, of course, but I also love them for a gardening theme. A blogging friend of mine does a flower shop theme in her dramatic play center. These would be cute for that, too! If you do a flower shop theme in your preschool, here is another dramatic play idea! The overarching concept of this spring theme printable is straight-forward. 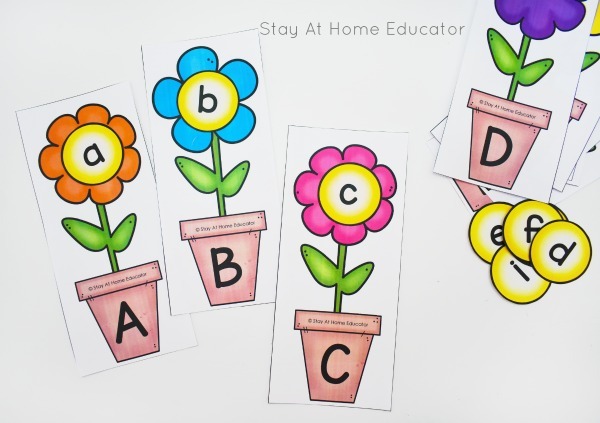 Preschoolers match the lower case letter in the bright yellow circle (to be the flower’s center) to the matching upper case letter on the flower pots. Place the circle on the blossom to complete the flower. 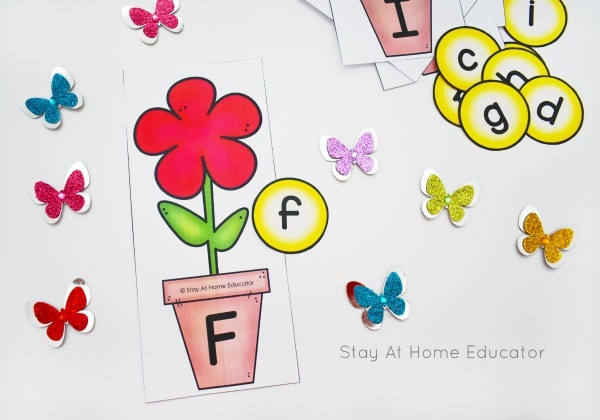 You can grab your own FREE flower theme letter matching printable at the end of this post. If your preschooler hasn’t mastered all the letters in the alphabet, start by offering the flowers you have already introduced. You might start with the letters in their name, too. Or if your preschooler is most familiar with upper case letters, then start there. If you are using this super cute spring theme printable to introduce a few letters, then do just that. Introduce only a couple of letters at once and allow your preschooler plenty of time and plenty of play with those letters before expecting correct letter recognition on every recall. Be sure to see all the other ways you can modify this activity below. 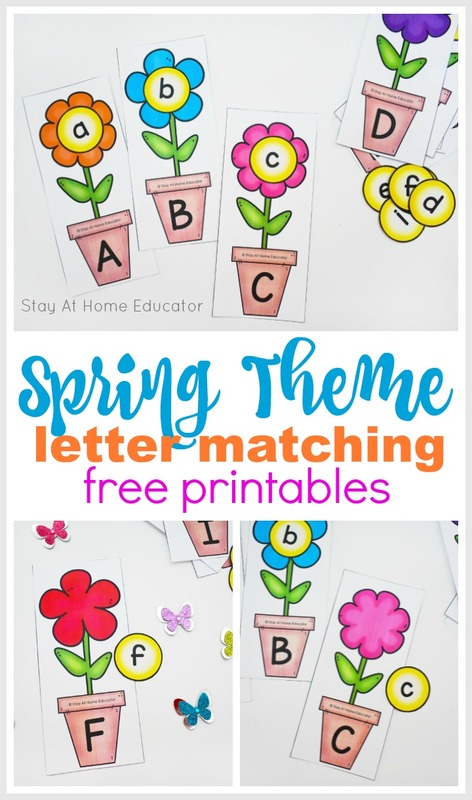 Don’t forget to download your own FREE flower theme letter matching printable at the end of this post. I’m sure your preschool classroom is very typical in that there are multiple levels of abilities in it. Here are some ways to modify this activity for different students in your classroom. Add some math skills and invite your preschoolers to sort the flowers by color. Have your older preschoolers sequence the letters in alphabetical order. 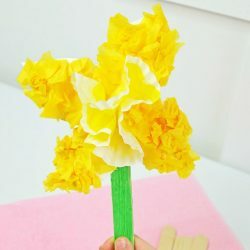 If you have younger preschoolers, offer one flower at a time with two options for the centers, rather than having them sift through all the options at once. This will help them keep from getting overwhelmed. Invite your preschoolers to sort the capital letters by shape, like straight or curved lines, and the match the lower case letters. Discuss if the lower case letters “match” their upper case versions with their shapes. Invite your preschoolers to spell their names using the flowers. You can also do sight words, too! 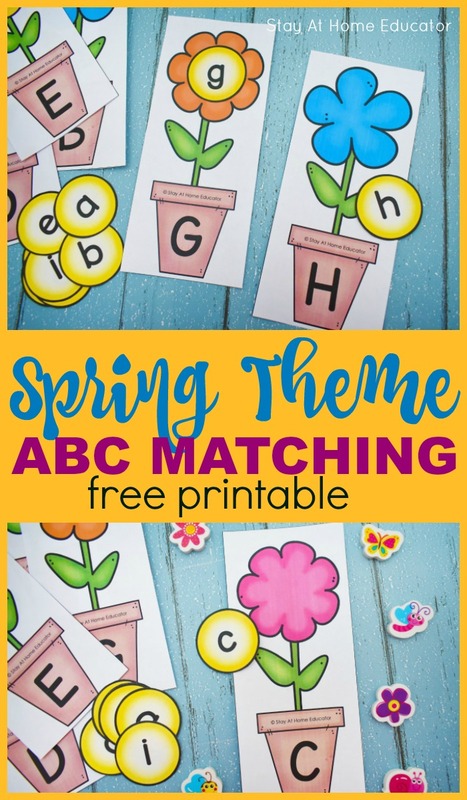 Looking for More Spring Theme Printables for Preschoolers? Need another flower or spring theme printable to add to your lesson plans? Check out some of these! Then grab your free flower letter matching printable below! 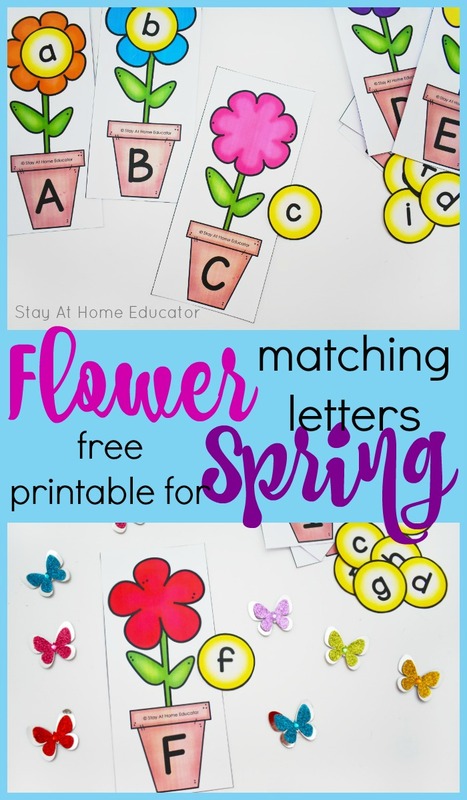 Grab Your FREE Flower Letter Matching Activity Here! Think this is something you could use in your lesson plans? Grab you copy by clicking the image below.